Everybody is Gaiya's human. They're just all wonderful and very interesting. At one time, Gaiya appeared to be as close to our idea of perfection as we've ever seen, let alone bred. Gaiya is definitely the most level-headed, naturally handleable llama born here to date. With her love of interacting with strange people, she is a natural at pubic relations activities, and could even pursue therapy work if we chose to spend out time that way. Gaiya has also inherited her sire Highlight's lightness and athleticism, and grandsire Dusty's ultra-powerful rear end "engine." We would rate Gaiya's gaits as excellent; physically, she should be a natural in harness. Unfortunately, no llama is perfect, and at maturity, it became clear that Gaiya's coat is not truly classic — her neck sheds out, but her body does not shed well, nor with the marked seasonally synchronicity of the true classic phenotype. Everyone dreams of breeding a llama that suits them as well as Gaiya suits us; most people are never able to achieve that goal. 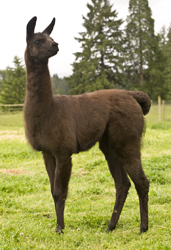 Gaiya was a much-loved member of our llama family, and we eagerly anticipated adding her to our breeding herd. We found what we believed to be the perfect stud match for Gaiya, and were extremely disappointed to discover she has a cervical defect, making successful reproduction not only unlikely, but potentially lifethreatening should conception manage to occur. Gaiya is an exquisite gem; we planned to keep her anyway and to enjoy her to the fullest, but ... we realized we also had her perfect human partner in our waiting pool, and that Gaiya would receive substantially more attention and adventure opportunities from that match than if she remained here. It will be hard to find another llama to fill the working roles Gaiya was growing into, and we miss her cheerful, grounded presence. Still, we know we've done the right thing for Gaiya, and that she will be happy and living the life she was bred for. Gaiya was born on Earth Day (for what that's worth — we're normally uncomfortable with names referencing something as arbitrary as a particular day on the western calendar). However, Gaiya is certainly of the opinion that we are all one, and should conduct ourselves as such — respectfully and congenially, but with healthy boundaries, too.